I’m not a big fan of always posting pictures of rooms when it comes to describing accommodation. The hotel has to be pretty stunning for the picture of its beds to look good. That’s the thing with “Eco” Hotel Dalia. It’s nice enough; some would say very nice. 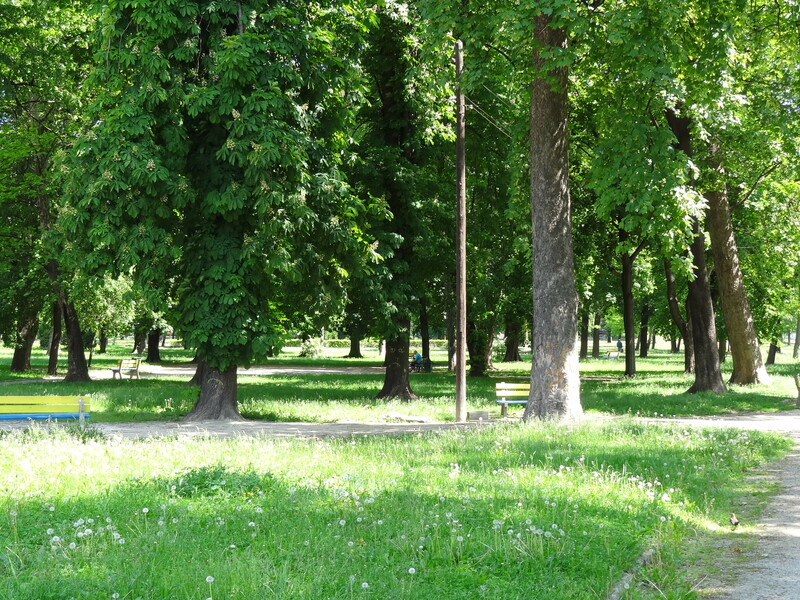 Its location, near the lovely leafy Mestský Park in Košice, is a good one (see pic) – convenient to the train station yet also peaceful. But it’s harder to capture its other charms. Its courtyard approach is part-bedecked by flowers and a fountain but it’s also given over to a large, un-decorated parking area (despite the hotel blurb about encouraging guests’ use of public transport). Its reception area has beautiful plants draping over it from an upstairs balcony but the somewhat sour-faced staff detract from that. As for the rooms, website pictures suggest boutique (and some are) but our “economy-quality” room looked no more exceptional than any standard pension offering. This Eco Hotel certainly came into the Košice accommodation game with noble enough ideas, I would have said. But as the few years since its opening have passed, those ideas are more and more on paper rather than in practice. “Economy quality” really says it all. Eco Hotel Dalia obviously desires to be regarded as upper-end. But it’s found a lot of clever ways to get away with saying that without providing upper-end service. Take the list of “eco” practices supposedly carried out by the hotel in order to justify its name. “Dual flush” buttons on the toilets? I think almost every hotel in Slovakia could offer that. Taps set on “eco” mode. They were no different to the taps in almost every Slovak hotel bathroom I’ve had the pleasure of experiencing. Take the wellness facilities. The sauna was not working when we were there; “under construction” until the autumn. Take the welcome drinks served on arrival. They weren’t offered to us. And I am always dubious of a “3.5” star hotel. In this case, if in doubt round down to the nearest whole number rather than up. We slept well. The rooms are very large for the price. And those not in the main building, if less interestingly decorated, do have little private courtyards bedecked by plants. There was just not one characterful, unique thing to say about the accommodation. And I am pretty verbose when I want to be. The breakfast is actually very very good. A variety of different cakes and pastries, piles of fruit, the ever-delectable “hemendex” (ham and eggs) and a platter of cheeses. Although the juice was not fresh (I expect that in an eco hotel) and the coffee ushered forth, lacklustre, out of a vending machine. The outside courtyard tables get a few guests partaking of drinks on a summer’s afternoon. The restaurant just inside though, despite looking nice enough, was always deserted during our stay (and was on my previous visit) – which perhaps tells you all you need to know. This “vacillating” between standards – this talk of relative luxury when the evidence of such luxury was found gravely wanting – makes me look back on my stay the other week at Hotel Dalia (add “Eco” on the beginning if you wish) in a rather ambivalent way. On the one hand, it offers pretty good accommodation near to Košice’s transport hubs in a serene spot within a 10-minute walk of the centre, and would be on any list of top ten Košice hotels. On the other hand, it charges the prices of a middle-to upper-end hotel and doesn’t back that up with the facilities – and could be so much better. If it advertised itself as a pension (standard guesthouse) I wouldn’t be so hard on it. But it advertises itself as an elegant, alternative type of hotel. And it’s not. PRICES: 3* double from 74 Euros, 4* double from 94 Euros. Singles are from 59 Euros for 3* and 79 Euros for 4* accommodation. There’s one suite too (109 Euros). Prices are 5 Euros cheaper on Friday/Saturdays. These prices are correct as of 2017. The breakfast described is included in the price.